Evolution theory and all the things related to it, has been an interest for me. 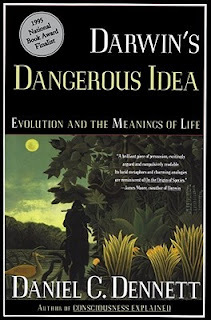 This time I wanted to dig deeper and read Darwin's Dangerous Idea by Daniel C. Dennett. It is highly appreciated book with good reviews. It was a book I wanted to check out. I had assumptions that this book dives in to the subject deep, but still I got amazed how deep it went. It started from old philosophic thoughts and then worked its way to Darwin and to latest thoughts in 1990's. All the topics were covered thoroughly with scientific way of comparing things from all perspectives. Book covers subjects from the beginning of the whole universe to meme's. It talks about God and evolution theory. It covers philosophical thoughts. There is almost anything one can think that affect Darwin's original thoughts. As an ordinary, non biology or philosophy expert, I was sometimes overwhelmed about all the information there was. Even tough sometimes I wasn't able to understand everything, I just kept going and tried to catch up later on. I did enjoy the book. It was pretty hard to read, but the contents were such a valuable and brilliant, that it turned the book to positive experience. I did learn a lot during this book. It raised a lots of thoughts all the time I was reading it. For sure this wasn't the last book about these subjects I read. I need to know more sometimes. I can recommend this book to people who are genuinely interested on Evolution theory, philosophy or biology overall. Without this interest, book might get too hard to read and follow. It is an excellent book, but pretty laborious to read.